More political correctness at universities: "UCLA law professor learns Ferguson-related exam question taboo"
But students complained, and writer Elie Mystal at the popular legal blog “Above the Law” opined that the test question was “racially insensitive and divisive.” Mystal also incorrectly alleged that the question asked students to “advocate in favor of extremist racists in Ferguson.” . . .
Other law professors say there should be no need to apologize for such a straightforward exam question. “If there are some law students who are such delicate flowers that merely being asked to assess whether certain controversial speech that's been in the news is constitutionally protected, in a class covering the First Amendment of all things, then maybe they should find another profession,” David Bernstein, a law professor at George Mason University School of Law, told FoxNews.com. . . . . The rest of the article is available here. There are other good quotes in the piece. So what would have been wrong if the test had in fact asked students to make a case in favor of bringing legal action against Louis Head? Wouldn't students know how best to argue against that position if they first had to figure out what the strongest arguments in favor of it are? "For years, radical animal rights and environmental advocates have used all the tools at their disposal, including litigation, to attempt to ban lead ammunition," the NRA writes. "A ban on traditional ammunition would affect hunters, sportsmen, law enforcement, military and target shooters — whether or not they hunt. There are currently no comparable alternatives to lead ammunition in terms of cost, ballistics and availability. This bill would prevent a traditional ammunition ban and protect not just hunters, but millions of American gun owners." . . .
Marcus Gould, 25, and Leon Roberson, 20, face charges of Attempted Capital Murder and Aggravated Robbery, according to police. Roberson was booked into the Washington County Detention Center at 1:55 a.m. and is set to appear in court for an 8.1 Hearing on Monday (Dec. 7th), according to the detention center’s website. Police said the incident happened around 9 a.m. Saturday at the C & S Gun and Pawn Shop at 1208 South Thompson in Springdale. Employees reported two men walked into the store, one wearing a gray hooded sweatshirt and the other wearing an orange hooded sweatshirt, police said. “They split up, they both pulled out hand guns that looked like black semi-automatic pistols and began to rob the store,” according to Lt. Derek Hudson with the Springdale Police Department. “One of the employees also pulled out a weapon and there were shots exchanged.” . . . Sergeant Daniel Grubbs with the Fort Smith Police Department, said Gould arrived at Sparks Hospital with a gun shot wound to the forearm. . . .
A video is also available at the link. My son's news article at Fox News: "College president sorry for saying 'All lives matter'"
The president of prestigious Smith College is red-faced and apologetic Tuesday for telling students on the Northampton, Mass., campus that "all lives matter." Kathleen McCartney wrote the phrase in the subject line of an e-mail to students at the school, whose alumni include feminists Gloria Steinem and Betty Friedan, former First Lady Nancy Reagan and celebrity chef Julia Childs. McCartney was attempting to show support for students protesting racially charged grand jury decisions in which police in Missouri and New York were not charged in the deaths of unarmed black men. Protesters have adopted several slogans in connection with the cases of Michael Brown and Eric Garner, including "Black Lives Matter." McCartney's more inclusive version of the refrain was seen as an affront that diminished the focus on black lives and racism, according to emails obtained by FoxNews.com. The Daily Hampshire Gazette, which first covered the story, quoted one Smith sophomore, Cecelia Lim, as saying, “it felt like she was invalidating the experience of black lives.” . . .
My newest piece at Fox News: "Media Matters, the facts and me"
Media Matters purports to correct misinformation that the “conservative” media puts out, but, ironically, they have systematically hidden comments critical of their work from their readers. They have a blog where it appears that conservatives and others can respond, but they don’t tell their readers that they have regularly removed responses that they couldn’t answer. I have been attacked in over 80 posts on Media Matters over the years. They have even criticized reporters from such places as the Washington Post and the New York Times just for interviewing me. They have described me as a “discredited gun researcher.” They have claimed “Gun Advocate John Lott Lashes out at Trayvon Martin’s Mother.” They say I’ve misrepresented Obama’s record on guns, what “assault weapons” are and the views of police on gun control. They have used doctored pictures of me and screen shots of posts. Media Matters uses a hit-and-run strategy: Attack, and move on to the next attack. They never acknowledge responses, even those published in major media like the ones I’ve written for Fox News. If Media Matters started engaging in debates, their readers would quickly learn that their criticisms of others involve mischaracterizations, carefully edited quotes and outright lies. Their unwillingness to post contrary comments says a lot about their inability to defend themselves. A typical example was their March 20 post covering a piece I wrote for FoxNews.com on Vivek Murthy, President Obama's nominee for surgeon general. Media Matters’ headline read: "On Obama's Surgeon General Nominee, It's Medical Experts Vs. Discredited Gun Zealots." With 288 mainly positive comments on their post, Media Matters apparently worried that people might find the ones I posted with a link to the discussion on my website. So Media Matters simply removed my comments. . . . . While this product can be used for finding many items, in watching this video I was particularly struck by how it is can enlist all sorts of other people in helping you to find a stolen item. Note that there are only four states that don't fit the pattern. Virginia is a right-to-work state but it has a Democratic governor and a Republican legislature. Iowa is a right-to-work state but Democrats only control one house of the state legislature. Wisconsin isn't a right-to-work state but it has clear Republican control of the state. Ohio isn't a right-to-work state but it has clear Republican control of the state. Besides those four anomalies, all the other red states are right-to-work states and all the right-to-work states are red states. Still even these anomalies aren't that far off, Ohio almost became a right-to-work state and Wisconsin has changed the rules for public employee unions so that people can't be forced to join a union. And Virginia was close to having Republicans in control of the state. 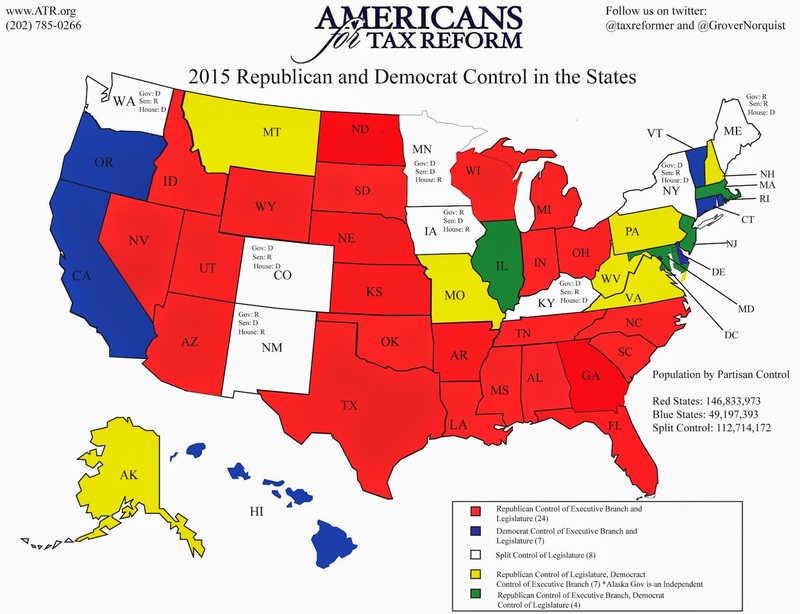 Iowa was also more red than blue. 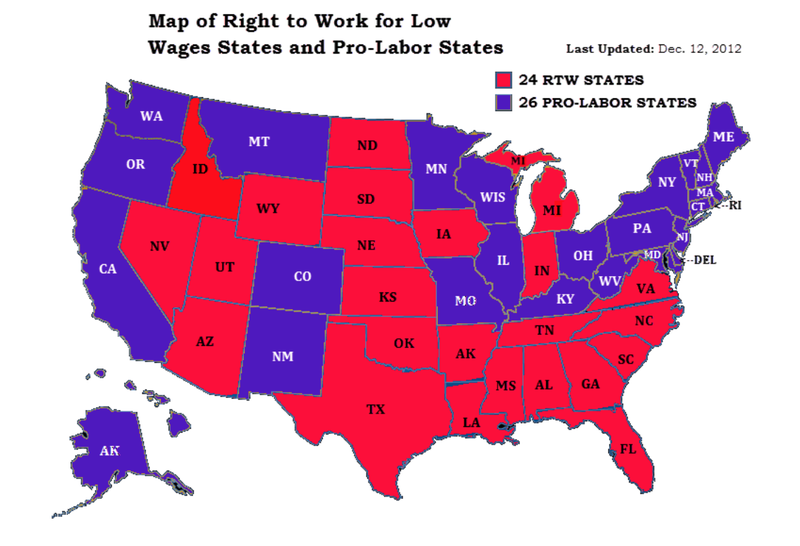 Thus the two right-to-work states can hardly be classified as blue states and the two red states are hardly solid anti-right-to-work states. The question is one of causation. Do already trending red states support workers making the their own decisions on whether they should join a union? Or do right-to-work laws make it so that unions can't raise a lot of money from people who don't want to be union members so that the unions can support Democrats? I don't know of anyone who has studied that question carefully. 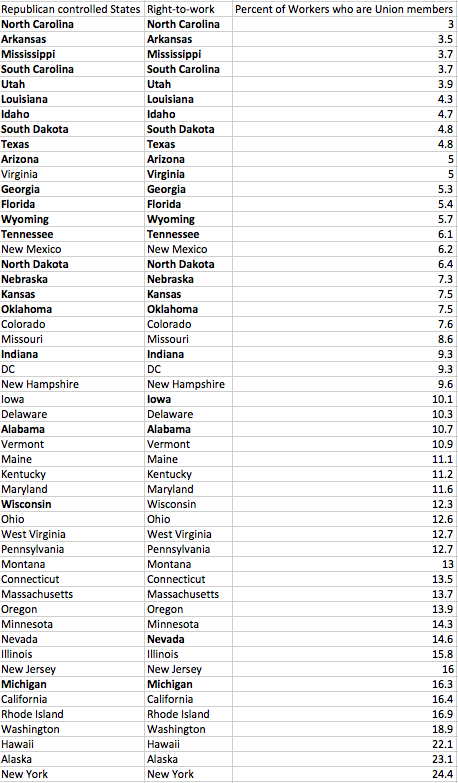 Here is a list of states ranking them by the percent of workers in the state who are union members (Republican controlled and right-to-work states are in bold).